In February of 2018 EvilSponge got a promo email that Reliant Tom was releasing the debut single for their second album. Like so many promos i get, this band had a history before i ever heard of them. I downloaded the single, called S.O.S., and thought that the band did a really great job of capturing that smoky, buzzed, exhausted feel that Portishead and Massive Attack used to drive the nascent Trip Hop scene back in the 1990s. Okay. 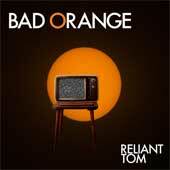 In September, Reliant Tom released the second single of off the album, so i went ahead and downloaded Happy Birthday. This one takes trip hop and pushes it forward. There is a whooshing keyboard and the sultry sad voice of Claire Cuny, rich and powerful, singing lethargically about being depressed on the verses, and then really bellowing birthday wishes on the choruses. And on those choruses, her guitar clangs angrily and the drum machine clicks away. On this song, Reliant Tom take the trip hop template and perfect it. So when their new album came out two months later, i snagged a download from the promo company to give the whole thing a listen. Happy Birthday is, by far, their best song. But it is such a tour de force that it is unsurprising that all of the other songs on the record are weaker. However, Reliant Tom manage to come close to that transcendence a few times. The record starts with a syncopated beat and the guitar chugging along, before her rich voice comes in. Bad Orange showcases that voice nicely in a dark, moody guitar pop tune. Cuny's musical partner, Monte Weber, steps up for Alien, an electronic tune with skittering IDM beats and his keyboard popping in layers behind her voice. The combination works nicely. Happy Birthday is next, the third song into the LP. Simply wonderful. Cuny's voice is nicely layered on Poor You. Cuny sings under echo in the background with her lush vocal tones on top. The song grinds along nicely, but her voice is the real standout here. The late-night trip hop of lead single S.O.S. is next. But to follow that up they offer String, a song which does something that i have been looking for in music for almost 30 years now: someone bringing that trebly, clattering, chiming Andy Summers guitar sound back. Cuny channels Summers’ Walking On the Moon here while Weber layers a burbling NIN beat. An odd juxtaposition, but it really works. I like this one a lot. Keys echo and some kind of percussion clatters alongside a strange spacey whooshing, like the sound of a thousand voices murmuring in the distance, make up the ambient interlude Divergent. This song packs a lot of interesting sounds into a five minute track that doesn't even leverage the strength of Cuny's singing! On Counterfeit Reliant Tom remind me of Underwater. The drum machine is flat and clattering, her voice is slightly echoed with long drawn out notes, and keyboards and other sounds echo and pop. Reliant Tom wrap things up with Someday I'll Be King, where they manage to sound like Lamb. Cuny singes higher in her registry, which makes her voice sound like Lou Rhodes. Weber burbles on the organ with skittering beats to nice effect. So i am impressed. There is a lot going on here, and i would love to hear more from Ms. Cuny and her voice.